twitchquotes: PLEASE STOP ASKING IF I CAN STACK 3 can: I can easily stack 3 of these stupid cans, even 4 And that is absolutely none of your business.I can stack 4 or 5 whether you ask me or not. 4 ME DrinkPurple. EZ DrinkPurple PLEASE STOP ASKING IF I CAN STACK 3 can: DrinkPurple I can easily stack 3 of these stupid cans, even 4 DrinkPurple And that is absolutely none of your business.I can DrinkPurple stack 4 or 5 whether you ask me or not. EZ 4 ME DrinkPurple. 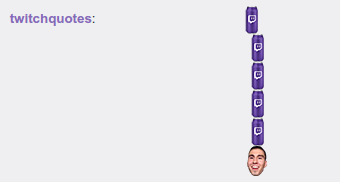 twitchquotes: Only the chosen one can stack these cans! but wait can you do three cans! ! !